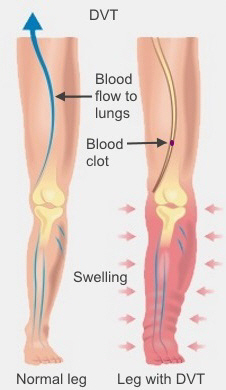 A deep vein thrombosis (DVT) is a blood clot in one of your leg veins. DVT can sometimes cause a very serious condition called pulmonary embolism, which is a clot in one of your lungs. Because DVT can be serious, if you suspect you might have one, or if you are experiencing any symptoms of a DVT, see your GP as soon as possible. sometimes the veins are obviously sticking out. some blood conditions, for example, high platelets. Your doctor will assess you and decide how likely it is that you are experiencing DVT. If it's possible you might have a DVT, you may need to have an ultrasound of the affected leg, a blood test, or both. The ultrasound is likely to be free of charge under the public health system, however, you may prefer to pay to have this done privately. If the ultrasound or blood test shows you do have a DVT, you will most likely need treatment with blood-thinning (anticoagulant) medication. Your GP may manage this treatment with support from Acute Demand. Alternatively, you may need to go to the Canterbury DHB Haemostasis Service at Christchurch Hospital. Most people do not need to be admitted to hospital. Your doctor may suggest some tests to find out what caused your DVT. To reduce the risk of further problems, your doctor may suggest you wear compression stockings, but they're not suitable for everyone. If you wear compression stockings, you can buy a device to help you put them on. This video shows you how to use one of these devices. You can buy a device like this at your local health and mobility shop. Some people may be at high risk of having another DVT. If you are one of these people, you may be advised to continue taking blood-thinning medication, or to take it in circumstances where you might be at risk of another DVT. Information about blood clots and how to reduce the risk of them forming. Information about TED stockings, including how they work, how to put them on and how to care for them. Information and video about DVT. Includes detailed information about symptoms, causes, diagnosis, and treatment. Factsheet that discusses the link between DVT and long journeys, and gives prevention advice. Written by Haematology Department, Canterbury DHB. Adapted by HealthInfo clinical advisers. Last reviewed August 2016.